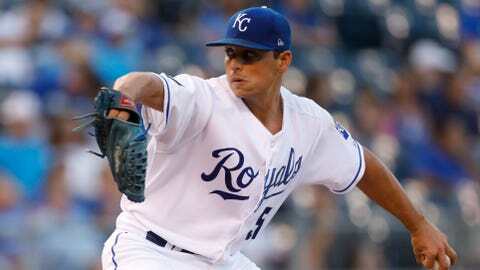 Jason Vargas, Sunday's starter against Arizona, is among the core Royals players becoming a free agent. KANSAS CITY, Mo. — While the Arizona Diamondbacks will continue their season, the Kansas City Royals have a Sunday celebration planned for the regular-season finale. After advancing to the World Series in 2014-15 and winning it all in 2015, several members of the Royals’ core group will become free agents after the season. That list includes first baseman Eric Hosmer, third baseman Mike Moustakas, shortstop Alcides Escobar and center fielder Lorenzo Cain. So will 18-game winner Jason Vargas, who starts Sunday. They helped change the Kansas City baseball culture after the Royals went 29 years without making it to the postseason. 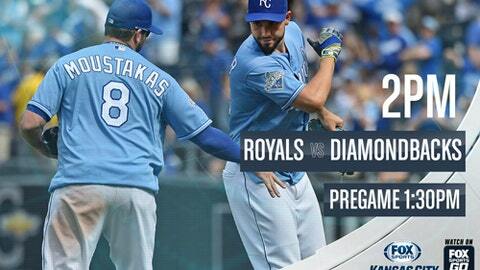 “A combination of young and old” will play in the finale, Royals manager Ned Yost said. “I don’t really expect to play our guys nine innings. We’ll just see how it goes. I may mix in some of the younger guys later in the game. He said he has not yet mapped out his strategy for the finale, but expect the four soon-to-be free agents to start and come out sometime during the game. “We’re at the point now where we want to try to get some at-bats for the younger guys, but still provide the fans an opportunity to see our star core players,” Yost said. The players know after the final out Sunday, they will all never be teammates again. If Vargas wins Sunday, he would lead the American League in victories. He is tied at 18 with Corey Kluber and Carlos Carrasco of the Cleveland Indians. Vargas (18-10, 3.94 ERA) has won his last four starts, beating Detroit 2-1 in his previous outing, when he allowed one run and five hits over six innings. Vargas is 9-5 with a 3.59 ERA at home this year. He is 2-1 with a 5.93 ERA in four career starts against Arizona but has not faced the Diamondbacks since 2012, when he was with Seattle. Diamondbacks manager Torey Lovullo is primarily focused on Wednesday’s National League wild-card contest against the Colorado Rockies in Phoenix. He announced to the surprise of no one that Zack Greinke would start Wednesday. The winner advances to the NL Division Series beginning Friday against the Dodgers in Los Angeles. “We want to evaluate our guys the best we possibly can, piece by piece, situation by situation,” Lovullo said. “The hard part, the challenging part is, that one situation on Wednesday could totally change our Friday. But we can’t assume that Friday’s a Friday until we get through Wednesday. Left-hander Robbie Ray, who is 15-5 with a 2.86 ERA in 27 starts, will start Sunday but come out early in case the Diamondbacks need him Wednesday. If the Diamondbacks advance and don’t use Ray, he would start Friday against the Dodgers in Los Angeles. Ray, who has never faced Kansas City, is 8-1 with a 1.79 ERA in 14 road starts this season. His 217 strikeouts are the most by a NL left-hander and rank second in the majors to Boston’s Chris Sale (308).